How do you fix headphones with sound in only one ear? The most common fault on a pair of audio headphones is sound only coming from one ear or side. If you have an expensive pair of earphones, replacing them by buying new ones is not always the best option. For headphones or earbuds that cost $50 dollars and above, most people will choose to fix it themselves. For many high end headphones, there is probably a warranty that may still be covering them from defects. Before you attempt to cut any wires or disassemble the headphones, contact the manufacturer first… there are links to many headphone companies at the bottom of this page. here is where to get them at a GREAT PRICE and most have FREE shipping. There can be many reasons that a pair of headphones only play audio out of one ear. The most common reason for sound to only come out of one side is the wires near the audio jack have gotten bent back and forth so many times that it has caused a short in the wiring. To fix your headphones correctly, you will need a few tools and materials available at your local Radio Shack or similar type of electronic store. With the correct tools and materials, you can fix that pair of broken headphones yourself. Headphones Quick Easy Fix: Many times if you twist or bend the wire on the headphones, the sound will work for a very short time. This is a good hint as to where the wire has shorted out. For a super easy quick fix, just apply electrical tape to the wire where it was working when you bent it. Keep bending the wire and when you isolate the shorted part of the wire, add the electrical tape in this area while keeping the wire bent. This will hold the shorted wires together creating a temporary fix to get sound to come out of both ears. Then when you are ready to fix it permanently, read the step by step tutorial below. NOTE: The below headphone repair tutorial is to be done at your own risk. Follow the below step by step DIY procedure only as a last resort. This fix and repair procedure will work with headphones, earbuds, earphones, and any other type of audio headset. Step 1: The first thing to do to fix your headphones yourself is to plug them into an audio source. Step 2: While audio is playing and you have the headphones on, move your hand up and down the wire and bend it every 1/2 inch to try and isolate where the wires have shorted out. Step 3: Once you hear sound in BOTH ears, you have found where the wire is not properly connected or has shorted (most commonly it will be right next to the headphone jack). Step 4: Isolate this area by putting masking tape to the left and right of where the short has been found leaving an inch or so in between the tape. Step 5: Take the wire cutters and carefully cut the shorted area of the wire out by cutting an inch or so on EACH side of the shorted area of the wire (since you found the faulted spot on the wire where it has shorted out, you are now removing that part of the wire completely by cutting and removing a half inch or so on EACH side of where you found the faulted wire). Step 6: With a pair of wire strippers, strip back the wire shielding on both sides to expose the wires (there should be 3 different wires, one red, one black or white, and one copper but yours may vary). Step 7: Once the wire shielding is stripped back, you will then strip the exposed wires to reconnect them. Step 8: Strip back each wire using the wire strippers. If the wire is super small you may need to use sandpaper to expose the wiring underneath (these are the color wires under the wire covering, the red, black or white, and copper wire, the copper (ground) wire will be straight up copper and has no wire covering so you do not need to strip it). Step 9: Once the wires are stripped and exposed (add the shrink tubing at this step if you are using it) reconnect the wires together (red to red, black to black, etc) using your method of choice. You can splice them together using any splicing method or use a solder gun. Step 10: Test the headphones to make sure you are now getting sound from each side. Step 11: Once everything is working properly, use shrink tubing or electrical tape and wrap it over the repaired area of the wire to further protect it. Congratulations, you have fixed your headphones yourself! If you have a high end pair of headphones costing over $50 dollars, there is a good chance your broken headphones are still under warranty. Check online for more info as many headphone makers offer a lifetime warranty on select audio products. Links to the most popular headphone manufacturers: Beats, Bose, Klipsch, Master & Dynamic, Monster, Philips, Sennheiser, Skullcandy, and Sony. The wiring on your headphones is fine but the plastic headset has broken? If your headphones plastic headset piece that sits on top of your head has broken or cracked, you can fix this by using a simple 5 minute epoxy glue or Sugru self setting rubber to mend the plastic. There are video tutorials here for this procedure in full. Do you have an easier way to fix audio issues on a pair of headphones? Please leave a comment below. My earphones after it got accidentally stuck under a desk when I stood up and got pulled started to have less sound on its left side even at full volume it’s so hard to hear. How do I fix it? I use my headphones when dancing and today my left earbud randomly stopped working (it was still working when I was dancing hour before and it randomly stopped emitting sound an hour later when I was just on my bed.) I had to move the wire next to headphone jack to get the sound back. This is not an easy fix. There HAS to be a way to get the sound back without cracking our headphones open and soddering anything. There HAS to be a better way other than shelling out cash for a new headphone. I have leeco lepdh401IN CDLA earphones I had just dropped it but still it was working fine but after some days I could just hear the left earbud’s sound but with low intensity while right earbud was working perfect.what should I do please help. The left earbud works but it is not as loud as the right earbud? Is the wire damaged or twisted? Any sign of a problem on the wiring or the earbud itself? What was the cost of your leeco lepdh401IN CDLA earphones? I have the headphones Audio Technica ATH M550. The problem is the sound in left side slowly fading until it’s gone. I tried replugging it in the jack, sometimes it works but only a few minutes it’s broken again. I can’t strip the wires because it has a flat cord. The Audio Technica ATH M550 Headphones are expensive. When the cord has a short, we recommend to purchase a new cord instead of attempting to fix the short. Check here for a few different cords for your headphones around 20 US dollars each or less. Thank you for the reply, I apologize for this mistake, my headphones is ATH WS550. I tried opening the left and right earcups (not sure if this is the right term) , but everything is fine, the wires are soldered ok.
Is there a way to re-route the the sound to just the right earbud on a Chromebook? If not, I don’t have access to the materials in the tutorial, so is there an easier alternative to fixing the left earbud. I have Apple iPhone earbuds that came with the iPhone and all of a sudden the left bud stopped working. I’ve tried turning the jack, bending wires to find the short but I can’t. I have JBL T150 Headphones. 1.) Left part of the earphone not working (no sound) but same wire also have connector (mic). 2.) Wire not broken from anywhere. 3.) Sound quality also reduced as it was before ( as plug in the same phone always). 4.) How to resolve this problem, i am not sure what to do with it. I tried bending the wire trying to find the short, but i still only hear from one side. what do I do? I dropped my earphones and now the left side has no sound, how would I fix this? I have Jaybird Bluebuds X and the Left Bud is not Working, I only get audio in the right bud and the left if I bend it alot, but It only stays a couple secs, help DIY guys! My Sony rig headset mic can’t be muted and a mic that can be muted. I am a gamer so i use the muted mic, but only the right side works when i use this mic. All the rest are fine. I have Philips earphones and my left side has stopped working and I don’t have the warranty with me for a while. I searched for the shorted wire and found it right next to the jack. I have to give it a little bend upward toward the jack and I get the sound from both ears but it happens only when bent in a certain direction and the bend that it needs is so small that tape won’t hold it in place. And I don’t know if I can use that method above either because there’s no place for half inch of cutting right next to the jack. And I don’t know if I can pull the wire out the jack and then put it back or not. I do know that it’s my own fault bc whenever I’m lying down I lean the jack on my chest and bend the wire in a very bad position and that’s why I can’t get myself a new set. I have Sony headphones with only the right side working. Moving the wires doesn’t help to bring sound through both sides? You need to find the section of wire on the right side of the headphones that has the short. Once you find it you can fix it using the methods above. Put the headphones on with sound going to them and run your fingers up and down the right side of the wire going to the right ear… Bend the wire back and forth from top to bottom. You should HEAR sound once the shorted wire is bent at the right spot and you will know where the short is. Bend the wire until you hear the sound, then an easy fix is putting electrical tape around that area with the wire bent. This is a fast but ugly fix. You are better off stripping the wire and repairing it. I have Zipper earphones and I am getting the same sound problem and I think the part of wire from which the the microphone is connected has the problem. I don’t know how I should deal with it. What do I do if the “WIRES/SOLDER JOINTS ON SPEAKER HAVE COME LOOSE” but I have no access to a soldering iron. Please help, I really love these headsets. We would recommend getting or borrowing a soldering iron. You can find inexpensive soldering irons at any big box store or in any home improvement store. If you do not have the ability to obtain a soldering iron and you must fix your headset, try Soldering Without A Soldering Iron. You have a bad wire in the area you are holding on your Beats SOLO 2. If you are afraid to cut into the wire, bend the wire until you can hear the sound and then use a piece of electrical tape to bend the wire and keep it in place in that specific area. My earbuds only partially work if I turn the jack, should I replace it? The wires or wire near the jack are shorted. Replace the jack or cut the shorted wires out and resolder them or use a method above. I only could find the part where when I bend the wire a little there is no sound, Help please? I have a Beats by Dr.Dre headphones. The area of the wire on your Dr. Dre headphones when you bend the wire is where the “short” is located. You can either replace the complete cord or splice the shorted area to fix the wiring. If you know how to solder, you can easily replace the whole cord and this will fix the issue. I tried dismantling the headset side that wasn’t functional and moved the wires around but no sound. Could it be a problem due to somewhere else on the cord? I have a Turtlebeach headset. Yes you may have an issue with the cord. If you did not find a bad wire in the headset of your Turtle Beach headphones, then most likely the wiring sound issue is a shorted cord. Usually this occurs right where the cord and the jack connect. The constant bending of the wires shorts out the wire right above the jack. Many times the cord will short out and no sound will be heard in both ears. Sometimes the right side will NOT produce sound or the left side will NOT produce sound. Either way the cord needs fixing by either replacing it or finding the shorted part of the wire and fixing it using the methods above. The right side of my Sony headphones isn’t working at all when bending the wire. I can’t seem to find the broken part of the wire what can I do? Check the wires where the wiring goes into the headphones on the right side. There is a short in the wire and the only way to fix it is to find the exact location where the wire is shorted. Examine every inch of the wire. If you cannot find any short, it may be the speaker in the right headphone that needs repaired or rewired. I have wireless headphones and the left side stopped working. Seems to be everything is okay. I checked the wires and they are perfectly connected but its not working.. What can i do? I need help! The speaker on the left side of your wireless headphones may be blown or bad. If all wires are intact, then that is most likely. What brand is your wireless headphones? Are your headphones bluetooth or does it transmit the sound from a designated transmitter? yes…its bluetooth. beats TM-006 is there any chance to fix it? Yes it’s bluetooth, Beats TM-006… is there any chance to fix it? Take it apart and check the receiver portion of the Bluetooth Beats headphones. Check the speakers and wiring inside the headphones. Most likely there is one loose or disconnected wire and soldering it back into place will fix you Bluetooth Beats Headphones. My Sony headphones stopped working… I opened it the wires are still well connected. What can i do? If the wires on your Sony headphones are still intact, you may have a bad speaker, or the wiring near the jack is shorted. I can’t fix my Philips in ear buds. What should i do? The left one is not producing sound. Try moving the cable that attaches right below the left ear bud to see if there is a possible short in the wire. Usually the issue is at the jack. You may have to strip the wires and reconnect the wiring. I have wireless headphones and everything is working but the left wire has fallen out and I need help putting it back in. You will need to take the left headphone apart and solder the wire back into place. I have an earpiece that came with Samsung note 3 that I have been in use for 2 years. The right earpiece with the mic and controls just stopped working. The controls on the right piece are still working fine except no sound, creating an imbalance effect. I have a regular pair of apples earphones and the right only plays on my phone but on the computer it plays on both sides, What should I do? Try moving the cable around near the jack, you may have a bad wire right behind the jack. If so you can rewire them or replace. I have iPhone 5 headphones and one of the earbuds does not work. I looked inside and the speaker part isn’t attached to the wire. I need help fixing this. What do i do? You will have to resolder the wire back onto the speaker on your iPhone earbuds. That is the only method to fix it properly. The only other option is to buy a new pair of Apple earbuds. I found it! Yay! The source was a loose wire around the mic piece. I’ll proably take the mic piece apart and fix it. THANKS! I have a pair of Samsung earbuds that came with my mom’s Galaxy S4. Since she already had a pair from her previous phone, she let me have the new ones. The left earbud works fine when plugged into a device, but the right earbud, which has a mic/ volume piece on it, doesn’t have any sound or even static coming from it at all. HELP! You most likely have a shorted wire. The issue may be where the mic is located or down where you plug it into a jack. Put the earbuds on, plug into a source, and slowly bend the wire starting from the very bottom where it plugs into the audio source. Work your way up while bending the wire back and forth. Hopefully you will hear sound in the right earbud and this will tell you where the wire is shorted. You can then either repair it or add electrical tape to where the short is by bending the wire until you HEAR sound, and then tape the wire in place with the wire bent. May look ugly but it works if you are not willing to cut and repair the wire. I have Skullcandy headphones which I bought 3 months ago. Suddenly they stopped working. I wanted to know the reason and how to know where is the break. Do both of the speakers produce NO sound? You most likely have a break in the wire near the connector where you plug the male part of the wire into the jack. Plug the headphones into an audio source, play audio, then feel from the jack upwards and bend the wire back and forth to find where the break is located. Then mark the wire at that point. You will need to then cut the wire, strip it back an inch above where the break is, and rewire a it with a new male audio input. Let us know what you find. There is a better description of how to do this on the page above. I had a question. Does it have to be electrical tape or will regular tape work just as well? Thanks. When repairing headphone wiring, never use scotch tape, masking tape, or duct tape, it will fall off and not work, always use electrical tape. Electrical tape is always the top choice when doing any type of electrical repair on headphones, head sets, or ear buds. I don’t wanna risk breaking my head phones, so I don’t know what to do because I don’t wanna cut anything. If your head phones are not working properly, such as audio or sound in only one ear, this is usually the sign that you have a bad wire. You may be able to bend the wire until you hear the sound in both head phones, and then apply electrical tape to the wire to hold it in place. However… The best method of repairing headphones with sound in only one ear is cutting the wire so you can repair the faulty wire. My headphones have a cord that you can unplug and plug back in. The sound is starting to short out and my cord for the headphones is flat. How would i fix this? Those types of headphones are made so you can simply replace just the cord since it has a detachable cord. Get a new cord from the exact company that makes them on Amazon and you should have perfectly working headphones. Bose is one company that makes the headphones with a detachable cord so if the cord gets damaged you can simply buy a new cord and you are all set. Here is a pair of one of the best lightweight Bose over ear headphones that have a detachable cord. My headphones only work from the right side. What should I do? Check the wiring right above the plug for a bad wire. The movement from the plug bending back and forth over and over can cause your headphones to have a short in the wire causing the sound to come out of only one side. I had an old pair of Cyber acoustics headphones with microphones. One side stopped working so I bought another pair. The new pair isn’t working either, I only still get sound just on one side. I doubt it’s the wiring. What else can be wrong. 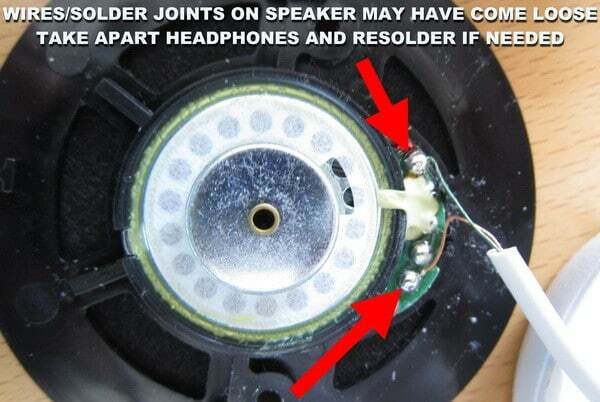 If you have checked the wiring then the issue is in the speaker or the wires that are soldered to the speakers. You can try disassembling the headphones and checking the speakers to see if they are damaged or the wire is loose. I had the mic on and high volume. The mic was recording the sound from the head phones and later sending it back to them repeatedly. An irritating noise. And about 5 minutes later I noticed only the right speaker worked. I have no idea if that noise had something to do with it or if a cable have snapped off over time. What brand of headphones? Also is the sound only coming from the right side? Have you checked to see if the wiring above the jack is causing the issue by bending it back and forth while listening? I have a Pair of Skullcandy headphones, and the sound has stopped on the left side, what should I do invest in new head phones or try to fix them? Thanks for reading and for any advice. If the sound is coming out of only one side on your Skullcandy headphones, you can rewire them with an affordable kit or buy new. Just do the math and see what makes more financial sense. Usually if a pair of headphones cost over $60 US dollars, it is worth fixing. If worth lower, buy new but buy headphones that have the detachable wire such as Bose headphones. Bose SoundTrue Headphones have the audio wire that comes off. This is a great feature as if the sound stops working in one or both ears, you simply buy a new audio cord and plug it in. I need your support, I have problem with my Beats Dr. studio headphone wireless but can’t find where. It works out the left side wireless only but with the cable plugged in I can listen from both sides. What Can I do to fix it as soon as possible? It may be that the wireless broadcaster has an issue. If by plugging in your wireless Beats headphones with the cord both ears work, then there is no wiring issue with the headphones themselves. Check wireless base broadcaster. what if the shortage is directly by the jack? Buy a new jack, cut off the old one about 2 inches up the wire, strip the wire, finely solder or use the methods on this page to connect the new wires together. Test to be sure it worked. Then you can use heat shrink tubing or finely wound electrical tape to cover the area. If using heat shrink tubing, put on the piece of tubing BEFORE you solder the wires together. Then when repair is complete, slide the heat tubing over the repaired area and use a hair dryer to shrink the tubing to the area. I have a new pair of Beats by DRE Headphones and I pulled out one of the wires going to the left ear speaker. How do I get this wire back in and connected? Can I do it myself or should I let a repair company do it? I have money to buy replacement parts. I just need guidance cuz these BEATS headphones are expensive but awesome. Please guide me on how to fix them. Thank you! When the wires have been forcefully yanked out of the headphone speaker assembly… Use a set of eyeglasses screwdrivers or similar small tools and open up the left part of the BEATS headphones to access the speaker. Be careful not to force open the speaker ear assembly or it may crack. Once open, locate where the wires were pulled out. You will need to strip the wires first if applicable. Next, slide the wires back through the hole and solder the wires onto the speakers terminals. If the wire is too short you will need to buy replacement wires with headphone jack. My earbuds are bent at the bottom of where I connect the part to my phone but before my left one stopped working I’ve noticed some glitching of the audio. Then so I stopped using the ear buds for 1 week but then when I tried to listen to music my left side of my ear bud completely stopped working. There is a shorted wire going to the left earbud. Put the earbuds in your ears, turn on music, bend the left speaker wire from the very bottom from the plug and slowly going up to where the wire goes into the left earbud. You should hear the music at one point as by bending the wire you will reconnect the broken wire. When you isolate where the wire is broken, bend the speaker wire until you can hear the music and immediately put a piece of tape to hold the wire in that particular bend position. That is a temp fix as it does not look professional. You could get a piece of tape that matches the color of your earbud wires to camouflage the fix. And NOW I know why my headphones weren’t working! So i have i pair of earbuds but i do not know what brand but only the right one works and i do not want to replace the jack how would i fix them. Bend the wire going to the left speaker all the way up and all the way down. Doing this will help you find the “break” or “shorted” point. Once you find it and you can hold the wire tightly and the music is heard through the left bud, use electrical tape to hold the wire securely in place. I have Beats Pro by Dr.Dre monster edition. Really don’t have too much of a clue on what to do. Some tips would be really handy bud. Whichever ear cup is not producing sound, that cup need to be opened and checked for wiring issue. May also be a simple wire issue but you will need to do some simple troubleshooting to find out for sure. Similar to first commenter, Melanie, I had a pair of Urban Ears Plattens that got into a tussle with a fence. Fence won and the headphones lost their jack – everything else is fine. Would a no-solder$ 4.00 1/8″ jack replacement from Radio Shack work for me too? Yes a replacement from Radio Shack should work. Give it a shot. This Method Sure Can Come In Handy…But Can This Work On Any Type Of Wired Headphones? It should work on all headphones with the right tools, know how and the correct replacement cables. I have a pair of turtle beach px22, I followed your advice and found the spot in the wire(the one that comes out of the headphones) When i striped the outer black covering I have 4 different wires. The red, green, blue ones are thin and i do not believe they cover a smaller wire, and a larger white one that has thin copper wires around it. The white one also has a smaller copper wire running through it. My question is, do i connect the thin wires as they are and strip the wire to connect the smaller copper wire inside it , or do I connect the copper wiring around the white wire? I don’t know the model name, but I have a pair of over-the-ear headphones whose right speaker isn’t working. I’ve tried bending the wire from one end to the other several times, and I got no sound. Any other possible fixes? If that is the case, the wire that attaches inside to the actual speaker could have loosened and fallen off. Or possibly the the wire in another part of the headphones is bent, crimped, or broken. We would suggest taking the headphones apart and visually checking the wiring to see if you can find an obvious issue. I have a pair of Roccat Syva in ear headset one side don’t work. There Is the microphone and the stop/play button but they both work what can I do? If you wiggle the wire just above the plug, does the sound intermittently come back on in the ear that does not work? If this is the case you can buy a new replacement audio wire and solder to fix. If the cost of your headphones is $40 dollars or less, it may not make financial sense. You can find some cheap replacement audio wire to fix your headphones but it may degrade the sound quality. with the right side not working. 45+15$ my own shipping down the drain. If I jiggled the right cable up from the y branch, the sound would come back and after probably too much jiggling, it’s now absolute silence on the right side, left side still good. I cannot locate the faulty wire anymore no matter how I press, tangle, jiggle the cable. It even detached from the speaker! top-quality Grado sound if I don’t use their own probably expensive cable (I don’t wanna anyway)? So, the sound was first cutting out AFTER the repair on the right ear IF you jiggled the wire around. Now you say there is NO sound from the right side and the wire has completely detached? Are you saying the wire is just hanging there as in pulled out of the right ear speaker? Please explain in detail. Also, if you choose to replace the complete cable, it is not a difficult job if you have the exact cable original OEM part. Is it not possible to find the exact cable? You should be able to find a high grade replacement that won’t cheapen your sound. Many online specialty headphone companies have compatible replacement cables if you cannot find the exact one you require. Yes I would agree, if they were cheap then that’s usually the quality too. However saying that expensive ones do get the same issue and the jack is the most common of them. With that in mind try twisting the jack or moving the wiring just above the jack. If the sound comes and goes intermittently you know it’s the jack, or in some cases the wiring just above it. You will then have to justify for yourself if you are going to get a new set or replace the jack. Your choice. If this does not prove to be the issue, either the wiring needs replacing or the left bud has had the wiring pulled off the speaker internally. 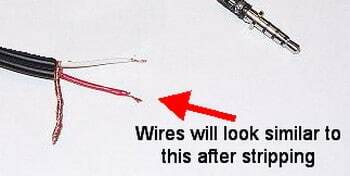 Partial wire replacement is also possible if the break is below the remote if there is one attached. It’s up to you really but that’s your options. I have some standard Sony buds but I can’t find where it has a break. Sound only comes out the left side. No static comes out the right side. What should I do? Not worth fixing. Buy new. First things first Adam. Try a different cable, as I am aware these have a 3.5mm jack port in the headset. By trying a different 3.5mm jacked cable will eliminate the possible chance it has of being that accessory. If you try a different cable and you are still having the same issue then you can try looking at the wiring inside. It could possible be the female 3.5mm jack port which is damaged. These are the 2 possible causes, it is very doubtful it is anything else, but there is always a remote chance it could be. I have some special edition (I think) Ryback headphones and it’s the type of headphones with the flat no-tangle wire. How should I fix this, I also can’t find the spot where the wire is broken. I noticed that I chew the wire at one place and I checked and I can’t seem to find any crackling or hear both ears. Maybe it could be a problem in the headwear part of the headphone? Please help!!!!! Most likely if both ears are not producing sound, it is the metal 3.5 mm jack that inserts into piece of equipment you want sound from. Your best bet is to purchase the complete wire with jack. You will then have to attach the wire to the ear pieces either by soldering or small screws. You can find replacements on Amazon for 3.5 mm jack with flat no tangle wire. I have a set of Sony Studio Monitor Headphones… that the wire went back to the one speaker… and i can fix it, but i need new wire… where can i buy this very tiny wire? You can buy a headphones audio replacement wire kit. Sometimes the wires in the universal kits are shielded and you can use a wire stripper and strip it back and cut it to the length you need. Amazon has headphone repair kits that are relatively inexpensive. Beats are harder to fix like many others are. It may help if they would have said that you need a 4 pole jack not a 3 and “No” they do not have 5 connection points they have 4 which is why they are called 4 pole jacks for 4 connection points. To solder 4 pole jacks you will need to be a bit of a pro. They are not as easy to solder as you may think. The smaller they are the harder they are to fit. As with the wire colors you would need to test these to ensure that you get the right combination, 2 of them will need to be twisted together in some cases headphones or earphones have 5 cores but only use 4 but it was a choice of wiring by the manufacturer. Believe me when I say all makes and even models differ from color to color and they will not try and make it easy for you. The best way is to test them with proper equipment to find out the correct combination or you could just send them to us. I have a pair of dr dre’s that does not have the jack end of it, it just has the headphone with a cord that is cut off there are 5 colors green, black, white, yellow, and brown can you please help me with telling me what each color does? Can any of these colors be doubled up like if they were for each side plus ground? Thank you in advance. Buy a $4.00 1/8″ jack replacement from Radio Shack, which has small screw connectors that don’t need soldering. There will be one that will be for 5 wire. Ask the store person if you are unsure. Once you have this you can simply attach the exposed wires to the jack.